If you ask Laurent Picciotto to go over the main points of his history with the big man at MB&F, you’ll initially be met by a long silence and a pensive look. Where to begin? What about the first meeting, when “Max” was on a work placement at Jaeger-LeCoultre? When he was head of Harry Winston Watchmakers? When he transitioned to become a designer, bringing together the greatest watchmaking talent at MB&F? These are all stages in Max Büsser’s career; yet the person who passed through them has been so different in each role that it can sometimes be difficult to see the continuity. Be that as it may, the link between the two men was indeed first forged in Paris, twenty years ago. 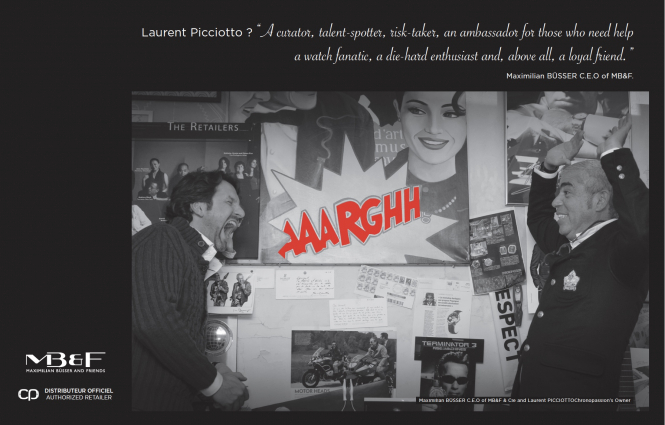 Laurent Picciotto had opened Chronopassion three years previously, laying the foundations for a brand that was to become a benchmark, but which at that time was pretty much a complete unknown beyond a tiny number of top watchmaking connoisseurs. Meanwhile the young Maximilian Büsser had just graduated from the Lausanne Federal Polytechnic School and joined Jaeger-LeCoultre. Max Büsser worked in Jaeger-LeCoultre’s Marketing department for seven years. He left in 1991 to move to Harry Winston. The 5th Avenue jewellers in New York City had already made some inroads into the watchmaking world, but without any major breakthroughs. The first timepieces dated back to 1989, but had failed to find much success. Output remained tiny, as the young Max Büsser sowed the seeds of high-class watchmaking at the jewellers. He was soon promoted to the position of Managing Director of the Rare Timepieces department. The two men then saw each other every year during the course of Harry Winston business. The watchmaking part of the brand, driven by Max Büsser, gradually took shape, “but I was interested only in the Opuses,” says Laurent Picciotto with a smile. A friendship developed and when Max Büsser left Harry Winston in July 2005, a new chapter in it began. Picciotto’s instinct was right, though. The first Horological Machine, HM1, came into being two years later in 2007. “This timepiece is difficult to apprehend – you need to put it on your wrist and wait a good quarter of an hour before being able make up your mind,” remembers Laurent Picciotto. The next part of the adventure is better known: four HMs and an LM, standing for Legacy Machine, a piece that pays tribute to watchmaking inventors. It is more aesthetically accessible but no less technically complicated for all that. Each MB&F item is the fruit of the greatest talents in top watchmaking, in terms of both watchmaking technology itself and design: Jean-François Mojon, Kari Voutilainen, Peter Speake-Marin, Laurent Besse, Jean-Marc Wiederrecht, Eric Giroud, and so on. “At the end of the day, MB&F timepieces really do need to be adopted by their owners. Max adds a touch of humour, born out of his uninhibited approach to watchmaking. It’s definitely a brand that brings a breath of fresh air to the watchmaking landscape, shaking it up to just the right degree,” concludes Laurent Picciotto.